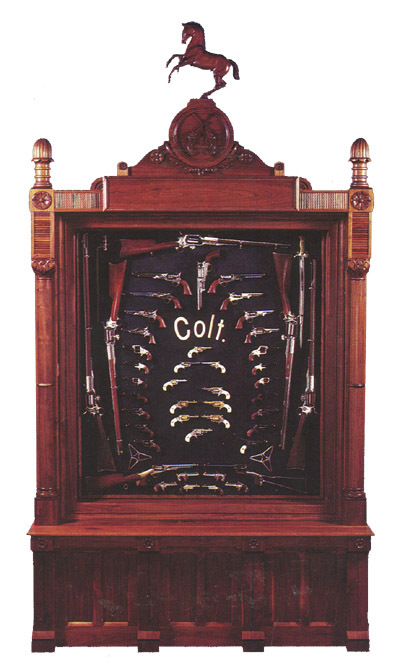 ColtCollecting.com is a collector's resource devoted to the firearms produced by the Colt Patent Firearms Manufacturing Company in Hartford, Connecticut from 1836 to present. In addition to being known for creating the most famous and highly successful firearms business, Colt's manufactured a number of additional household and commercially available products ranging from brake pads to electronic appliances. While the emphasis of this site is on Colt firearms, in the future we will be including examples and information on many of the other products manufactured by Colt. If you are searching for information on a particular Colt firearm or item and cannot find it, please let us know. We will do our best to provide you with concise and accurate information on all Colt collectibles. © 2001-2004 by Sam Lisker. All rights reserved. The ColtCollecting.com logos and all proprietary artwork and photos are the property of ColtCollecting.com and may not be reproduced or distributed without expressed written permission.